The unregistered arena also reported a very busy day with a vast array of classes being jumped in. In the biggest class of the day, numerous riders took to the arena in the 1.10m to take on the course by resident designer, Aaron McCusker. After some very time saving turns on display the eventually winner was Rachel McKibbon with Robert Moore’s Altaskin Buddy followed closely behind by Simon Scott and Luxs Like Candy. The SJI Spring Series returns April 13. 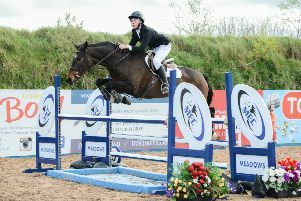 RUAS Young Event Horse Qualifiers will be held on April 9 and looking ahead a three day Grand Prix Show, with both the first legs of the Irish Sport Horse Showjumping Series and the TRM/ Horseware New Heights Champions Series from 26th- 28th April. 90cm - Divided between Rachel Harrison’s An Cailin Ora (Rachel Harrison), Jonathan Quinn’s Ballinamonapark Melody (Tori Showkum), Barbara Henderson’s Ballynakilly Brook (Barbara Henderson), Paul Caves’s Cafre quality clover (Paul Caves), Claire Gordon’s California Dreamin B Z (Hannah Agnew), Brian Barkley’s Drumrankin Serpent (Edward Little), Morris G Smyth and Elaine Smyth’s Elamo Cobras Diamond Girl (Hannah Agnew), Janet Roulston’s Halo (Alana Roulston), Noel Mckee’s Keeford Joy (Noel Mckee), Robert Mckee’s Lady of Honour (Robert Mckee), Judith Sossick’s Loughview Diamond Orla (Garth Swaile), Michael Beattie’s MB Suzelle Du Chateau (Michael Beattie), Karen O’hara’s Midnight Rose Cavalier (Michael Beattie), Ian Moore’s Pinecrcoft Galaxy (Ian Moore), James Hogg’s Pokerface JS (James Hogg), Evan Hobson’s Promise Me (Evan Hobson). 1m - Divided between James Hogg’s Abide With Me (James Hogg), Danielle Kennedy’s Bannfield (Danielle Kennedy), Melanie Haire’s Bonmahon Breakin Hearts (Harry Haire), Lauren Curry’s Cracker Camiro (Lauren Curry), Jane Clarke’s Delton (tadhg clarke), Lynn Kelly’s Donaghmore Dolly(aes) (Lynn Kelly), Lawrence Patterson’s Drumnaconnell Goody Bag (Izzy Riley), Morris G Smyth and Elaine Smyth’s Elamo Jack of Hearts (Hannah Agnew), Lorraine Leavesley’s Emerald Sunshine (Lorraine Leavesley), Eve Stafford’s Enrosewood Show Girl (Jonathan Creswell), Tracy Woods’s farnane lily (Zoe Woods), Avril Cox-Mills’s Finsceal Indianna (Lucinda Mills), Nicole Galbraith’s Foreign Affair (Nicole Galbraith), Jane Clarke’s Glenpatrick Cool Guy (Jane Clarke), Janet Roulston’s Halo (Alana Roulston), Patricia Creegan’s Holiday Izzy (Katie Creegan), Lisa Corry’s Inishcruise (Lisa Corry), Eileen Duggan’s Kilronan Chin (Eileen Duggan), Paul Caves’s Kinmar Piloth (Paul Caves), John Rafferty’s Lehmann (John Rafferty), Brian McLaughlin’s Lincourt Quality (Jonathan Creswell), Jim Maneely’s Madame Porsche at Cranny (Hannah Maneely), Shay Quinn’s Maryclint (Shane McCloskey), Karen O’Hara’s Midnight Rose Cavalier (Michael Beattie), Rebecca Buckley’s Millburren star (Rebecca Buckley), David Conlon’s Muckno Mac (Claire Conlon), Denise Owens’s Omard Connery (Aoife Owens), Ash-Lee Brown’s Omard Sansa (IHB) (Stacey Watling), Rachel Armstrong’s RMA on the Ball (Rachel Armstrong), Caitriona Cody’s Sandi Cruise (Tom Hearne), Catherine Chambers’s Seapatrick Beachball (Catherine Chambers), Lorraine Leavesley’s Sherlocks Opium (Lorraine Leavesley), George Newton’s Simply Grey (UR) (George Newton), Thomascourt Stables’s Thomascourt Darco Q (Mervyn Jr Clarke), Mervyn Jr Clarke’s Thomascourt Legaland (Mervyn Jr Clarke), Eric Smith’s Trebra Indoctro Cruise (Eric Smith), Mervyn Clarke Jnr & Johnny O’Hanlon’s Ultimate Quality (Mervyn Jr Clarke). 1.10m - 1, Robert Moore’s Altaskin Buddy (Rachel Mckimmon); 2, Leslie James Goudie’s Luxs Like Candy (Simon Scott); 3, Quality Sport Horses’s Newmarket Trooper (Dylan Ward); 4, Gareth Nethercote’s MTN Limmerick (Gareth Nethercote); 5, Tracy Woods’s Without Permission (Zoe Woods); 6, Leslie James Goudie’s Carrickadawson Star (Simon Scott). 1.20m - 1, Lisa Rosbotham’s Garronturton Beach (Olivia A Roulston); 2, David Campbell’s Derryinver Premier Sarah (Luke Campbell); 3, Quality Sport Horses’s Newmarket Trooper (Dylan Ward); 4, Francis Donnelly’s Beechmore Lady Lux (Eve Donnelly); 5, Gareth Clingan’s Delle Lux (Gareth Clingan); 6, Pat McCaughey’s Taplagh Lady (Tom Hearne). 1.30m - 1, Roy Craig’s Beltrim Brother Ava (Jonathan Smyth); 2, Trevor Clingan’s Ardtana Flash Forward (Charlene Clingan); 3, Joy Robinson’s Chardonnay (Shannon Robinson).